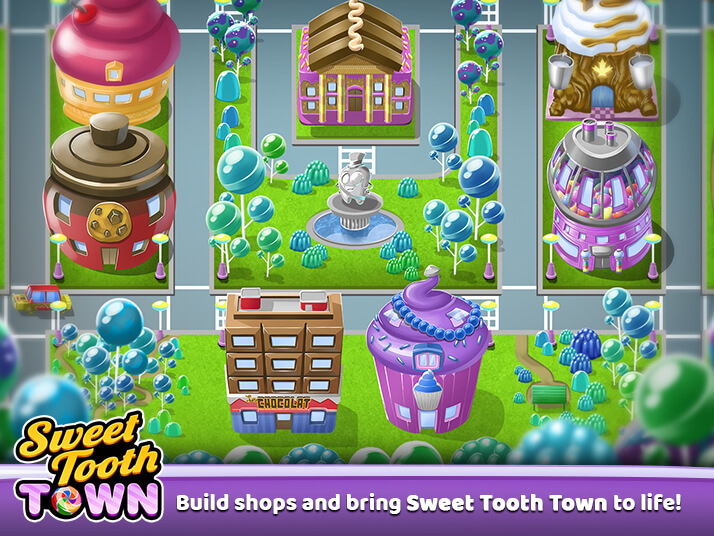 Sneak peek of Sweet Tooth Town, a new HTML5 game coming to Pogo (shown above). The images say “Build shops and bring Sweet Tooth Town to life!”, “Match candies to meet level goals and win.”, “Charge up shopkeeper abilities to unleash candied chaos.”, and “Overcome sticky taffy, caramel blockers and more.” This game is expected to be available in February. Sneak peek of a scene in Claire Hart Classic, coming Thursday. The good news is that it looks almost exactly like the original. February’s Game of the Month will be Word Whomp HD. The Solitaire Gardens marathon announced in the last Pogo Insider blog post has been changed to Mahjong Escape. It will begin February 5th. Another 10-game marathon is slated to start in mid-February. And the Solitaire Gardens marathon will be at the end of February. Poppit Party got new costumes today. Claire Hart Soul Searcher has been removed from Pogo in preparation to migrate it to Claire Hart Classic. The last Pogo Insider blog post gave a release date of 1/31 for its HD replacement, however today’s post says the new version “will go live the same day”. It is not yet live at the time of this post. Stay tuned. Question for Pogo: Do you know if (enter game name here) will be transferred over to HD? Question for Pogo: Is Sweet Tooth Town replacing Sweet Tooth 2? Answer: no, consider it a sequel. Solitaire Gardens, Mahjong Escape…no difference…there’s way too many marathons revolving around the same games! Yes that was what was originally said but here’s something interesting. My first thought when I saw ME was replacing SG as the marathon was “Oh Crap!” as I’d much rather do SG than ME. Then I saw this, so three marathons plus the Winter Quest in Feb? I’ll be picking what I do very carefully after I see the challenges. “Mahjong Escape Badge Marathon – Starts February 5, with five new Challenges. It’s just crazy, 3 Marathons in February, and the Winter Quest. And if the other 3 weekly badges are like the one coming out tomorrow it will be almost impossible to get everything done on time. They’ve lost their mind. I so agree with you Suz..I’m getting very discouraged with all these marathons.. It just isn’t fun anymore.. Gaming is suppose to be fun and relaxing.. This is anything but.. I hope this will change soon because I’m tired out with stress..
Plus the Master Challenge. Plus extra weekly usually goes with that. because no sale. I got a great deal on them one for each of us lol. So that makes it go down to the same cost as the big pack of gems. Think I’m going to let my membership run out now. They use the same 3 games it feels like for every single based game marathon in hopes to make gem sales. I’ve noticed less and less of my friends doing marathons lately. I’ve talked to a few and some aren’t renewing and are tired of the “newer mahjongs”. Not a good sign for EA as they are being boycotted pretty bad by console and pc gamers as well… let’s hope they start listening to customers .. eventually. Looks like we’re going to be kept very busy, and for free at that. for February! That is a lot for a short month!!!! I will repeat what I always say.. I enjoy the free badges, the marathons are ridiculous anymore. I will work at my own pace, I don’t care if I get them done on time or not just for a few extra badges. No one can see them in chat anyways. I still have not completed last year badge album due to quinns and I am totally okay with that. i still pay for my membership just for the games that I like to play. To me it looks like another game hijacked from a kid’s site, like Cookie Connect, that will be exactly as you described – changed-up to include the enticing purchase of power-ups to progress and all the rest of the silliness. Sigh. I find it interesting that Pogo Lama won’t allow any negative comments. My guess is it’s because these negative posts would outnumber the good ones by 100 to 1. This just goes to prove that they just don’t care what members think! Any organization worth its salt would want to know how to improve customer service. I agree with you 100% and that is the main reason I did not renew my membership. Too many badges to do in the shortest month of the year; Pogo is wearing everyone out.This is ridiculous; it’s being way overdone.Guess this is going to be their answer to taking tokens out whenever that happens. What I would like to know is whatever happened to site challenges? Haven’t seen one of them in ages. They did away with the site wide challenges b/c of the complaints from people who played for days, and then someone would post that they got the badge and never played a single minute. The personal marathons are fair, you only get the completion badge if you do the work. You are so right Suz, I do like the way we all have to do our own now and not have to work so someone else gets badges and never play. I am happy to earn my own and if I don’t get it, then oh well. I enjoyed playing. I almost feel the same about tokens. Hopefully they will come up with a reward system most of us will like if/when it is done. Wow so much going on. Going to be very busy clicking away but will keep the “fun” and maintain a stress free play and do what can be done. If everything goes well, great if not, then will keep going until completed whenever that may be. 🙂 Afterwards will have many more badges added to my collection. I love having all the free marathon badges! I don’t purchase any Mix-n-Match badges or Premium albums. I work on the free surveys to earn gems here and there and that’s the only time I purchase any badges. If there’s a badge that’s too hard, big deal. I’ll work at my own pace. I hope they keep having more free badges. That’s an awful lot of marathons and challenges going on in February! I think they will be doable, though, but I like Mahjong Escape and Solitaire Gardens. I am only a little miffed that they moved Solitaire Gardens one to the end of the month, I haven’t done the latest levels so I would have something new to work on during that marathon… oh well, I will have TWO sets of new puzzles to do, that should last me through the entire marathon. And I like Word Whomp as the game of the month too, so I won’t mind all the extra work. Yipppeeee…..they won’t take the mini mall away…we can keep what we have. That is good news to me. I agree with some of you that I will do the marathons at my own pace, and if I complete them, good, if not, oh well.. There are lots of hours left in the day, Betty. Luras’ info comes straight from Pogo sources so it’s much more productive if our impatience is directed toward Pogo itself.